“Our aims are simple,” says Kaliya Franklin, better known to the internet world as BendyGirl, “Oppose cuts to benefits and services which affect disabled people and fight for increased disability rights. “All it took was for one person to speak out against the injustice of the cuts for others to join with us and say ‘me too’. After the announcements in the Comprehensive Spending Review I made a video letter to the Prime Minister condemning the removal of the Higher Rate Mobility Allowance from state funded care home residents. I put it on video sharing site YouTube and there was such a great response that I made another video to the disabled people of Britain and asked them to share their stories with me to highlight the disproportionate impact of these cuts. Our sister organisation Carer Watch and journalist, Rhydian Fon James, had similar ideas about the need for a campaign based primarily online to allow the majority of disabled people to protest and The Broken of Britain was born. “We quickly realised that many people wanted to get involved and the best way to highlight these problems was through individual stories so appealed for people to send them to us. The rest we are working out as we go along! “There is a vast array of individuals and groups with physical disabilities, learning difficulties and mental health difficulties already using the internet to work together so at Broken of Britain we work with a wide definition of disability to include and complement all those groups. We are a user-led organisation, independent of all political parties. We believe that disability is a subject too vast andbimportant to be directed by political ambitions. We make use of the skills disabled people have in using the internet and specifically social media to lobby politicians and the mainstream media to give us the opportunity for our voices and viewpoints to be heard in a way not previously possible. “We are collecting as many individual stories as we can to be used as case studies to highlight that the cuts are going to affect ordinary disabled people and not the ‘benefit scroungers’ so vilified by the press, public and politicians of all parties. We have a forum to allow disabled people to come together and decide upon the campaign priorities. We have a blog to allow us to share all our stories. Our main website is currently being developed. We are welcoming volunteers, so for anyone who would like to be involved, can visit our forum and participate in the formation of our staff structure. “We hope to become a more formalised organisation in time and look to provide support for disabled people to work on a part time basis from home. For now we feel our strength as a lobby group comes from being a collective of people with the same overall aims. The way people are organising themselves rapidly using modern technology shows just how much a diverse group of people can achieve once they decide to work together towards a common goal. “If you feel that a situation is unjust and needs to change then in all likelihood others will feel the same as you. ‘Me too’ is much more powerful than ‘just me’ Alone we whisper into the wind, together we become the wind of change. Good luck to everyone involved in Broken of Britain. We’ve been over this ground before on Twitter but I am going to restate for a new audience. Although I applaud many of the objectives and methods used by people involved in this campaign I cannot endorse it fully. I jib at the title of the campaign. I do not call myself broken and I am not going to start demeaning myself or others by assuming that name. It just would not help me in some of the work I do if I labelled myself that way and I do not want to insult others by demeaning them in such a manner. Be realistic. I am never going to engage employers to take people on if I stress the negative side of disability. When someone is seeking work or trying to keep a job they need to emphasise their fitness to fulfill that role. Of course we need moments to vent our frustrations and even despair and we are all well aware of the impact of our own disabilities but to define ourselves as failures is too much for me. I do not want to define anyone as broken for life. 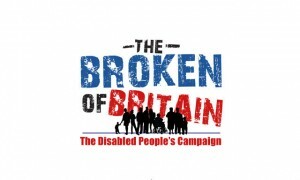 Broken of Britain is making good use of social media in gathering grass roots opinion. I applaud that but sooner or later members will have to grasp the nettle. Presenting case histories to the media and government is not enough. You need some form of political synthesis. Right now Broken of Britain seems like a pure protest movement. I can see what you are against but what are you for? Though you curently eschew politicians if you are to achieve your aim you are going to have to master some political tactics and there is no shame in that. So good luck to all those involved in the campaign. I will watch you. I wish you well and I am willing to debate with you but I cannot rally under your banner without losing my pride and self-respect. BrokenofBritain uses the net and media to allow people to represent themselves and the organisers of the campaign also slum it arguing with people like me. They are accessible, and my criticism of One in Four and the elite system embedded mental health networkers is that this open and democratic way of operating has been fiercely resisted in mental health to date and just to prove the point you turn up talking about pride and self-respect when you wont even acknowledge disability , as if other people should be ashamed to profess to having disabilities of any kind. You and Mark have bigged up NMHDU & its previous incarnation NIMHE and it’s relentless , secretive and boundaryless networking through SHIFT , the DWP and other vehicles with the larger mental health charity service providers – networking and cross-organisation arrangements so dubious and secretive it became very difficult to see where government stopped and the mental health charity sector started as the latter claimed to be representing service users but simply served Government ends. Right now NMHDU doesnt value your work around mental health and this Government wants you off benefits and into work asap whether it’s in journalism, your previous line of employment , delivering pizza leaflets or dancing on a table in a bar and your self-respect and pride don’t come into it. To the Tory Government you are a scrounger period, they don’t care what work you can cope with or what roles you think are appropriate to your background, qualifications and ability or even that you have a ‘ mental illness ‘, they simply want you off benefits and dont really give a toss what happens to you after that as long as you dont try to sign on again. At the same time, Government is cutting back practical mental health support services to deliberately expose and nudge people off benefits and into the mass unemployment abyss , a socially reckless mass targeting process that started under Labour, and even disabled people who thought to escape poverty through education now find that route blocked by cuts and realistic fears of unmanageable debt too. Unlike most of the elitist mental health networkers and mental health charity professionals who you align yourself with I’ve worked in disability employment and while it may seem socially responsible , inclusive and heroic of talking of ‘everyone working productively and fruitfully’ in some Walden Two-like future society that isn’t how the real world is or how its going to be any time soon , it’s just a mantra that suits the ideologues now driven by the Tory cuts machine and their own self-proclaimed mastery of behavioural economics . I personally think its demeaning that so many of the networked mental health service user elite bought into that mantra just as I now think it’s distressing that so many of them have fallen silent because when the cuts loomed their involvement roles , lets pretend jobs , paid for training days, party invites or whatever were the first to go. Self-respect includes standing up to power and saying things arent working because to reverse your own argument, I can see what you and the other system embedded elite stand for Bea, but I can also see that its illusory and isn’t even budgeted for as people with disabilities are being catapulted off benefits at jobs that simply aren’t there. That’s not being done to help anyone, its being done to save money and the real evil of this mass targeting approach is that they’re not based on people circumstances, abilities or disabilities, its all based on politically determined quotas . I’d really like help stabilising and getting into quality training or work but it simply isnt there yet I still got a benefits review letter the other day, I cant access any mental health services but i can be targeted and bullied by people who know less about real world economics, disability employment and in work support than i do . Last week my friend went to the NHSConfed Future of Public Health and Wellbeing leadership conference in London and he said he reckoned he was the only open service user there. So, a decade and a half of basically elitist system serving conference going and ‘mental health awareness raising’ outcomes in the Government and mental health system no longer viewing mental health as a disability in any way shape or form and pressing on with its own productivity, resilience and cuts agenda without any concern for ‘ involvement ‘ of people with mental health problems at all. How proud are you of that Beatrice ?